Record from data display. This option is experimental. Record from control display. This option is experimental. In celebration of the Spanish flamenco guitarist Francisco Gustavo Sánchez Gomes (known as Paco de Lucía). 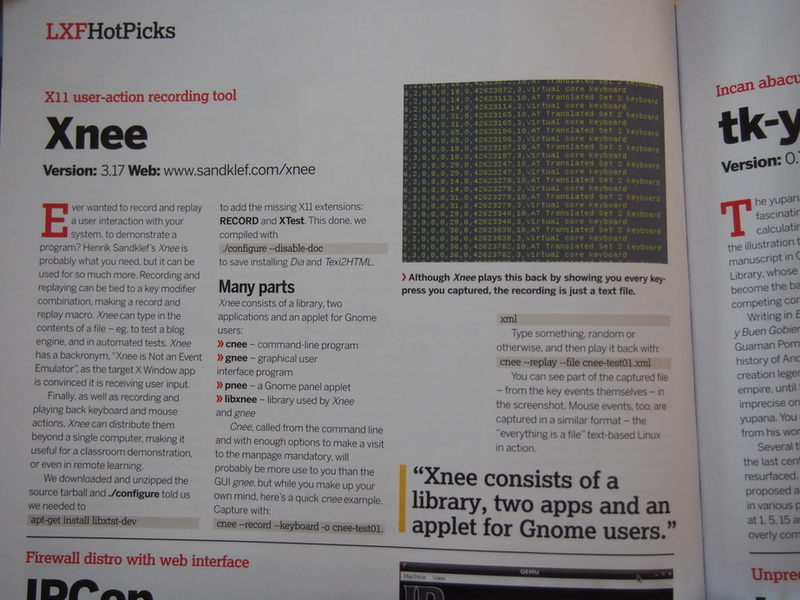 GNU Xnee was listed among the HotPicks In Linux Format. What is education and how do we educate? Lately I have been questioning not only myself, which is something I always do, but more importantly I have questioned more or less everything about education. I believe that a Kill Yer Idols strategy when reviewing situations in life is good. By applying this approach, which in this case translates into not fearing to question EVERYTHING, I found that the books on programming are really hard for newbies (I’d go as far and say some of them are totally useless) – some books were hard for me with my 15+ years experience as a programmer. I have also questioned the choice of programming language, the task of finding the best language remains. I have also ranted about finding a strategy. So what will I shamelessly, pointlessly and in the usual chaotic style ramble on about today? First I need to find the meaning of the word education. Or perhaps I need to find my own interpretation of the word. So this post’s quest is about finding a good, and in sync with today’s students view, interpretation of education. And with that as a basis discuss the teaching forms (lectures and supervision) and how to best use them to reach the goals (students acquiring knowledge). What does Wikipedia have to say about education? but may also be autodidactic. This leaves pretty much room for me as a teacher. I am avoiding the word lecturer since that word seems to imply that we are talking about lectures. I can do a lot of things to make the students learn, or acquire knowledge. I can motivate students to learn for themselves. I can stand in front of the class and talk for hours about some topics. I can ask students to read for themselves and remind them that they’re now doing university studies and all complaints are void. For me the important and interesting thing in the definition of education is the word transfer, or perhaps if we rewrite it as acquired which is what the students do. I will try to focus on the student perspective by looking at “acquiring knowledge“. Who is the education for? What is/are the teacher’s preferred way to educate? What is/are the students’s preferred way to get knowledge? Are the modern search engines today destroying our students? Oh my Emacs… so many words and nothing said yet. Sorry, I guess more words will come and an equal amount of stupidities. Interactive coding – write code from scratch “on stage”. Even if you make a mistake it’s good, since the students pay more attention to you – they want to spot more errors. Writing the code “in front of a live audience” makes it easier for the students to ask questions. Walk around and make gestures – don’t stand still. Change your voice – run the commands below for an idea how boring a teacher can be. Distract them – this is easily done for me since my brain usually wanders off in different tangents all the bleeding time. What ever you do to confuse them wakes them up and you can get their attention again for some more 10 minutes. Use the white board – don’t overuse presentation programs. By using the techniques above I think, I do not have proper backing here, based on my experience that I can transfer more knowledge to the students than I would otherwise. But still, I don’t believe that old fashioned lectures is the best way. In some courses I sucked and in others I sucked less. And I think that I’ve done a good job in some of them. I once held a course where I didn’t get enough time from my department to give the course – in this case I think that the lectures weren’t as good as I liked them to be .. sorry guys. In some courses I have gotten quite good reviews as a teacher, yeah I also find that hard to believe. But applying the Kill Yer Idols strategy here and really question myself as a teacher – given that a teacher should make sure that the students acquire knowledge – I must say that the students’ results were NOT better or worse when I got better (or worse) reviews. Does this mean that no matter how crappy the teacher is the students will always get the same results? No, but the quality of the teacher’s lectures is in my opinion exaggerated. So there is something spooky with lecturing. The reason is, as stated above, that the students aren’t paying attention and if a student looses focus for a minute the remaining lecture may in the worst case be useless. So why do we keep on lecturing? I don’t know. I really don’t know. It’s easier for us teachers to give lectures I guess – we just do our thing in front of the students for 90 minutes and then we can go back to our offices and read articles. It’s the way we’ve always done it. I tried out flipped classroom in the last term, as I mentioned before in the unlikely case that you’ve stumbled upon my blog before. I made some video recording of some of my lectures. The students liked the videos. I really disliked making them videos – listening to sound of your own voice is one thing but hearing yourself saying unrelated or stupid things was hard at the beginning – but that’s how my brain works so I better get used to it. Perhaps it is my Gothenburgian heritage that seem to make me do unintentional crappy jokes on the fly. It takes time to prepare a lecture. This time is increased a lot when creating videos so Flipped classroom isn’t exactly making things easier for teachers – unless the goal of the teacher is to help the student acquire knowledge 😉 . Another time I will write about my findings when recording them videos. All I can say right now is that I used (no surprise I guess) only free software (used GNU Xnee to retype the code for me). So the students liked the videos. But did we get a good discussion going? I will read more about flipped classroom and think about what can be done. But at least the students could look at a video over and over again and ask question about the subject at the lecture. Does flipped classroom make the student acquire more knowledge? One problem though. I’ve noticed that with Flipped classroom, compared to normal lectures, you can’t, for obvious reasons, adapt the lecture to your class. When lecturing the old fashioned way you can adapt and repeat based on the looks on the students’ faces etc. I miss this in Flipped classroom. Flipped classroom is good. But for some students it is just one way of lowering the barrier to acquire knowledge themselves. If a student have lost confidence I don’t believe classical lectures or Flipped classroom will help them. I believe Flipped classroom is better then normal lectures, given that the goal is for students to acquire knowledge. Lectures and/or flipped classroom will not help students who have lost confidence in themselves. When to use these ways? More on this in the next blog post which will be on exercises and supervision. And the name “No Show Jones”? It’s a tribute to one of my favorite singers of all time, George Jones. He passed away in April earlier this year. George earned his nickname from his habit of not showing up at shows. Searduino provides headers and libraries to program the Arduino boards. It would be stupid to rewrite the whole Arduino software so we’re of course using the Arduino source code. Currently the default way of building Searduino is to download (automatically done by Searduino) the Arduino source code from their download site and unpack that to a specific folder. This solution doesn’t work with Debian so we discussed a bit back and forth how to solve this. Every night we’re building Searduino (yeah, autobuilds are back again) and provide source code dist (tar.gz) and binary versions for 32 and 64 bit GNU/Linux systems. These scripts are internal and look so ugly at the moment so there’s no way you will se them ;). To test the Debian specific option (–enable-debian-source) we’ve set up a dedicated build server (Debian, unstable, 64 bit) that downloads the source code dist file (.tar.gz) and builds and tests Searduino from that. We use Jenkins to do the tests of the Debian specific stuff. We’ve been trying out the two VirtualBox plugins but we never got it to work properly. So instead we started using VMM and now it works nice. "cd searduino-dist && wget http://129.16.213.45/searduino-build/dist/searduino-git-$(date '+%Y%m%d').tar.gz"
"cd searduino-dist && tar zxvf searduino-git-$(date '+%Y%m%d').tar.gz"
"cd searduino-dist && ln -s searduino-git-$(date '+%Y%m%d') latest"
"cd searduino-dist/latest && make -f Makefile.git"
/opt/vmm/bin/ats-client --client-exec Debian-unstable-64 "export CFLAGS=\"-I/usr/lib/jvm/java-6-openjdk-amd64/include/\"; export CXXFLAGS=\"-I/usr/lib/jvm/java-6-openjdk-amd64/include/\"; cd searduino-dist/latest && ./configure --enable-debian-sources --prefix=/tmp/tmp-searduino-dist-debian"
"cd searduino-dist/latest && make check"
"cd searduino-dist/latest && make install"
The trend seems to be ok. So we’re now finally able to say that Debain can ship Searduino. The sun seems to be up. So we’re now finally able to say that Debain can ship Searduino. Also we’ve seen that it is possible to use VMM with Jenkins. VMM is a piece of software to make it easy to start, stop and use virtual machines/clients (currently supporting Qemu and VirtualBox). First a small introduction to Searduino. Searduino consists mainly of two things. First, a couple of libs (mainly the Arduino source code compiled and archived) and some Makefiles that together make it possible and easy to write pure C/C++ code for Arduino boards. Secondly, Searduino comes with a simulated Arduino board environment. This can be used to unit test your Arduino code (think automated tests). There’s also a couple of simulators, using the simulated environment, with which you interactively typically can validate your software. The simulation is implemented in a library which loads the Arduino code (on GNU/Linux and Unices using dlload) and runs it in a thread (pthread). This library can quite easily be wrapped by simulators and extensions for other languages That’s as much of an introduction I’ll give here. After several attempts to get the Python/Gtk simulator called Pardon, using the Python extension to Searduino (called Pearduino), to work well , I gave up trying. The threading support in Gtk seems to make it impossible to get both speed (and we do need speed) as well as an app that doesn’t crash due to too quick/unsynchronised GUI updates from the underlying thread. Don’t get me wrong – I like working with Gtk and I am a Gnome user since … hmm around 2001 (I think). The problem we’ve seen relates to the rather complex problem of combing C binaries loaded by Python and run that in a separate thread and have the results (via callbacks) update the Gtk GUI. So what to do next? How about a GUI in Qt? I have tried to get into Qt many times but always lacked the time to give it the time it needs. We didn’t have to think for a long time, since part of my new job at Gothenburg University will be supervising students in Java. Wow – or perhaps uhh – it’s been a while since I did some Java hacking. A long while. The students should also learn Swing so that will be supervised too. To be able to supervise in Java and Swing I needed, it turned out I really needed it, to refresh my almost forgotten Java and almost non existing Swing skills. What better way to do this than implementing a GUI frontend to Searduino in Java/Swing? Yup, that became the task during the Christmas holiday and also the answer to what gui framework to use for the simulator. I am more of an imperative/procedural (think C) hacker than an OO hacker (think C++, Java). I often use some concepts from OO when hacking C though – hey I don’t go about saying or thinking that mixing C++ and C is a good idea. Either you write OO (C++) or you write procedural (C). For me writing Java code for a Free Software project is a new thing. Anyhow, over the last days I have, to my surprise, found that I’ve started to like hacking GUIs in Java. Ok, I fall in to the traps of writing C-ish Java code (send the Spanish inquisition after me for doing that!!!) and I figure most pattern fascists probably will cry so much their bodies will dry out when looking at my Java code. Nevertheless I am happy with the speed of which I wrote the GUI. And apart from some rare and odd behavior when stopping (pthread_cancel) the pthread running the Arduino code it works really well. Updates in the GUI are really really quick. To be able to communicate with and control the C code I had to write a small JNI layer. Just as we did for Python with the Python extension. Comparing writing a Java extension to writing an extension for Python I would say they are equally easy to write. I think the fresh GUI is the “final” piece for Searduino to make it really useful for many people – so this blog post feels really nice to write. But hey, so many words and yet nothing has been said. I will try to say at least something useful. I am slightly surprised to say that I enjoyed writing a GUI in Java. It’s easier to join the project now – so join us!!!! We need you! Next step then. Next steps for Searduino that is? For me personally, I would like, for the fun of it and inspired by Andy Wingo‘s post on Scheme to finally be giving Scheme a go – it may not be the strategically most optimal choice but I’ve been wanting to learn Scheme for a while so why not. Leaving myself and my ego alone for a while and instead start thinking about what the next steps for Searduino should be…. I guess that’s up to you to decide. … and finally. I will be doing a lightning talk about Searduino at FOSDEM (thanks all FOSDEM volunteers for your friendly and informative emails!). So if you’re interested in seeing Searduino simulate some leds blinking and also actually seeing some real leds blinking – and all of this done in C/C++ – pop by the Searduino lightning talk on Saturday at FOSDEM. bug #37895: pnee/data/pnee.server.in file missing in 3.14 tarball? In December 2012 Ravi Shankar passed away. This is a way to pay tribute.